After choosing what to grow, the question is, how much do you want to grow? Do you simply want to grow enough to eat fresh throughout the growing season? Do you plan to can or freeze any for winter meals? Most tomato plants can easily produce twenty pounds of fruit. If you want to make a pasta sauce once a week throughout the year and your recipe calls for a pound of tomatoes, you would need three tomato plants for freezing tomatoes (52 weeks = 52 pounds of tomatoes, so 52 divided by 20 pounds per plant = 2.6 plants). One or two plants will meet your needs if you want enough tomatoes to eat fresh. 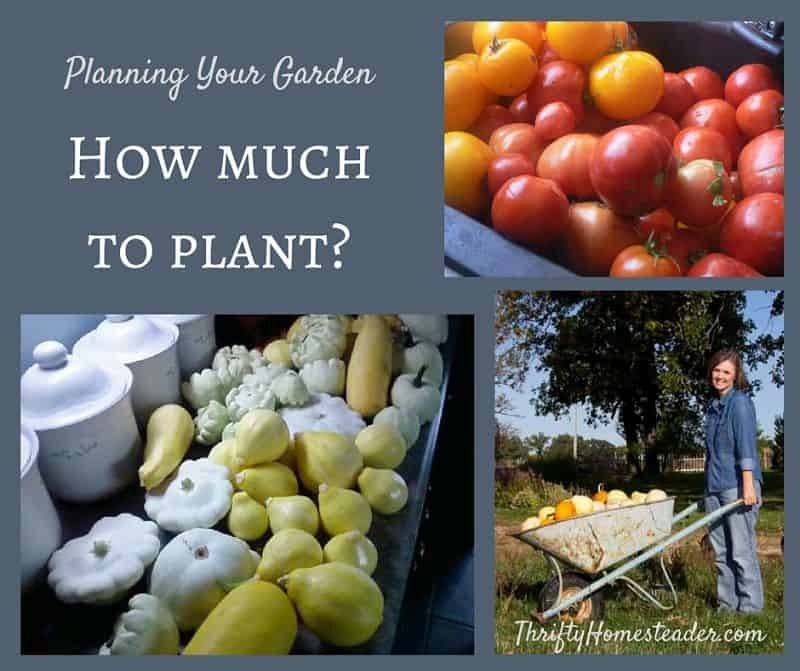 Add up what you need; then add an extra tomato plant for every four or five you need so that you have insurance against insect damage or underperformance due to drought, an early fall frost, or your own learning curve. Keep in mind that tomatoes on a particular plant will ripen over two to four months, or even longer in warmer areas, so it is not quite as simple as saying that you need two plants to grow forty pounds of tomatoes for canning. If you don’t have enough tomatoes to fill up the canner, it is probably more energy efficient to freeze them. Deciding how much to grow for cole crops is even easier. If you want to have broccoli at least once a week and you are willing to freeze it, you will need fifty-two plants. Assuming half a head of cabbage for a batch of coleslaw, you will need to grow about a dozen plants if you want to have coleslaw twice a month. One onion seed will become one onion, and the same is true of other root crops, such as carrots, turnips, and radishes. Figure out how many of these vegetables you eat per week and multiply it out. It is easy to underestimate the number of onions to plant if you forget that they can also be picked as green onions. Once you have decided what you want to grow, the decision to buy seeds or transplants is usually obvious. Root vegetables are started from seed, although onions can be started from sets, which look like baby onions. Plants like corn, which produce only one or two ears per stalk, are also planted directly in the garden from seeds. If you plan to grow only four or five tomato plants, it will cost less to buy transplants than a packet of seeds. In most growing zones, the smallest tomato transplants will do just as well as the larger, more expensive ones because tomatoes will not produce until the weather gets hot enough, regardless of how large the plant is. There are a few other things to take into consideration other than cost, though, when deciding whether to buy seeds or plants. Most garden centers do not have a huge selection of vegetable varieties. There is usually one kind of cherry tomato, a couple of different kinds of red tomatoes, and perhaps a yellow tomato or a striped one. The choices are even more limited with peppers, melons, and other produce, which are available in only one or two varieties. Unusual varieties will probably have to be started from seed, which you can order by mail. A packet of seeds can be split with a gardening friend, and extra seeds can always be saved for the next year. Although the germination rate will decrease slightly in subsequent years, most seeds can be saved for three or four years. Seed saving is discussed in the next chapter. It may be tempting to buy seed packets from discount stores, but resist. The packets usually have very few seeds, which may not be a problem for starting something like tomatoes, where each seed grows a big plant. But the packets of direct-seeded produce, such as corn and beans, usually don’t have enough seeds in them to grow much. This is especially problematic for corn, which needs to be grown in squares of at least four rows for proper pollination. Disease and low germination rate can also be problems with discount-store seeds. This is another mistake I made one year, thinking I would save money. In the end, I didn’t save anything, because the yield from those seeds was far less than from the seeds I bought from reputable seed companies. This is an excerpt from Homegrown and Handmade: A Practical Guide to More Self-Reliant Living, second edition.